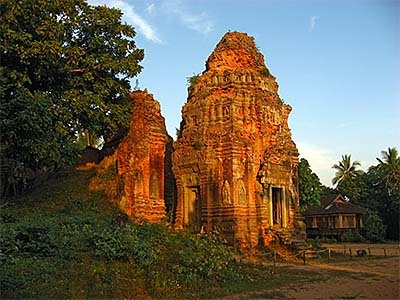 Roughly fourteen kilometers east of Siem Reap and north of Tonle Sap Lake lies the Angkorean temple group of Roluos. This area marks the place of the first capital of the empire of Angkor, which was called Hariharalaya. The name 'Roluos' comes simply from the contemporary village nearby. In the late 8th century a large group of Khmer went from the Mekong Delta riverupwards into the fertile plains around Southeast Asia's great lake Tonle Sap. Led by king Jayavarman II (reign controversial, 790 CE ? - 835 CE ? ), they probably escaped the pressure of Javanese who ruled with their superior navy presence over the Mekong Delta (see also Wat Ashram Moha Russei on Phnom Da). Jayavarman II declared his kingdom's independence in 802 CE, in the safe backlands of inner Cambodia. Most of the temples of the group are built by Jayavarman II's successors; Prei Monti is a temple who could date back to the first king's time. The name Hariharalaya derives from the Indian Hindu deity Harihara. The timespan of this capital ended almost hundred years later in 900 CE, when king Yasovarman I (reign 889 CE to 915 CE) moved his residence to Phnom Bakheng, close to later built Angkor Wat. 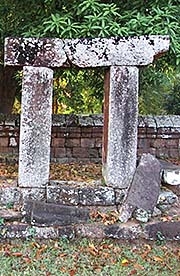 The Roluos Group consists of three main temple compounds, of who is the largest Bakong, close north of it Preah Ko and further north, on the other side of the NH6 Lolei. 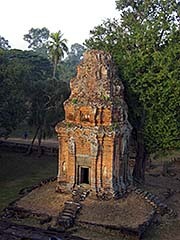 The two older temple ruins Prei Monti and Trapeang Phong are closely south of Bakong. Since the royal palace was, like always, built in wood, there is nothing left of it in the tropical climate. 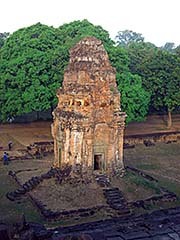 Nineth century temple mountain Bakong is the first large Khmer monument. It's a five-step pyramid, built in sandstone and marks a clear step forward in the development of Angkorean architecture. Inauguration of the Shiva dedicated monument was in 881 CE, in the reign of king Indravarman I. In a temple inscription is this king merged with the Hindu god and it seems to mark the beginning of the devaraja (godking) concept of the medieval Khmer. 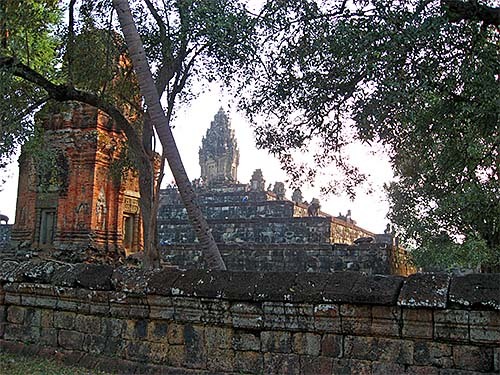 Bakong is one of the temples with four access roads from all directions of the compass. It's surrounded by voluminous water trenches and 22 subordinated brick shrines. The walls of the highest platform are decorated with reliefs of high quality, although they are very damaged after about 1,200 years. The central shrine, who hosted a statue of god Indresvara, does no more exist. There are certain similarities to the great temple pyramide of Borobodur in central Java, which leads to the assumption that Borobodur was used as a model for the construction of Bakong. 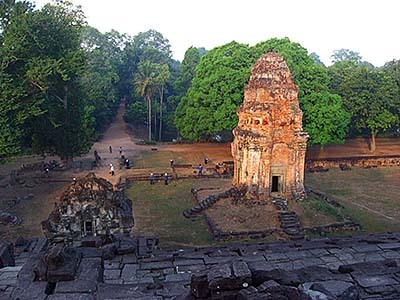 The influence of Javanese kingdoms like that of the Sailendra dynasty is also documented in the history of Funan in the Mekong Delta at Angkor Borei. Borobodur is only a few decades older than Bakong. Bakong was Angkor's state temple for a couple of years, but after the shift of the capital to Phnom Bakheng it wasn't abandoned. Later additions from the 12th and 13th century are documented. According to an inscription, the temple of Preah Ko was inaugurated in 880 CE. It's the second largest temple of the Roluos group, closely north to Bakong. Dedicated to Paramesvara (means 'The supreme lord of Shiva', a poshumous name for the king), it's a compound consisting of six towers on a common fundament. All the towers are dedicated to family members of the king except the main tower who is dedicated to king Jayavarman II who was also be claimed as an incarnation of Shiva. 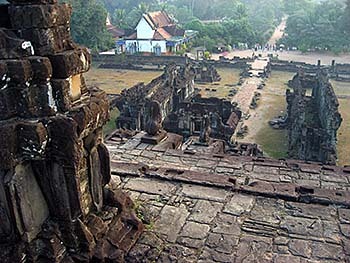 Preah Ko is surrounded by two laterite walls and a water trench. The walls here have the oldest gopuras in Angkorean architecture. 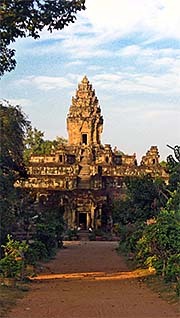 Later, particularly as the gates of Angkor Thom, they became so very characteristic for medieval Khmer building style. Also two library buildings appear here as part of the temple compound. The name Preah Ko (sacred bull) comes from Nandi, Shiva's vehicle. Nandi is a bull, and one of the three statues placed in front of the temple building represents Nandi. Lolei is the third site of the Roluos group, closely north of NH6. It consisted of four temple towers who were originally placed on an island in a large baray of 3,800m times 800m. The baray is now dried out. Of the four brick towers are only two in a better condition, one is half collapsed and the fourth collapsed in 1968. The former wall with the four gopuras is almost completely gone. Inauguration of the site was the year 893 CE. 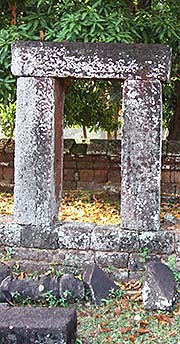 Lolei was dedicated to king Indravarman I and other royal ancestors. The name Lolei might derive from the capital's name Hariharalaya. On the site is nowadays a modern Buddhist temple placed. 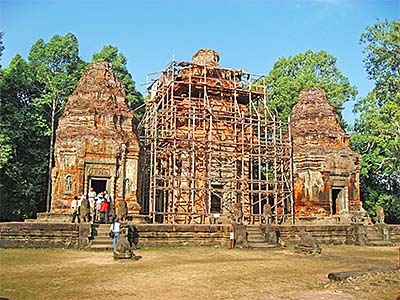 This article is based on several visits to Angkor Archaeological Park. Moreover it's based on a number of publications. You find a list of them on the Literature page. Particularly Maurice Glaize's 'The Monuments of the Angkor Group' are a good inspiration. However, it's not at all exhausting; it comes together with articles from newspapers, magazines, (qualified) websites and movies, both fiction and documentary. Sometimes, a good talk with a connoisseur of a certain topic provides me with facts, ideas, inspirations and innovations and/or reveals a mistake.